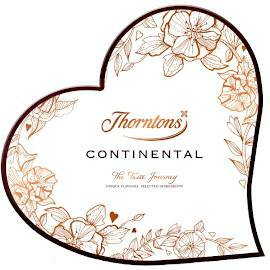 A box of chocolates from Thorntons with a selection of toffees, fudges and caramels covered in chocolate, the Thorntons Toffee, Fudge & Caramel Collection Chocolate Box. 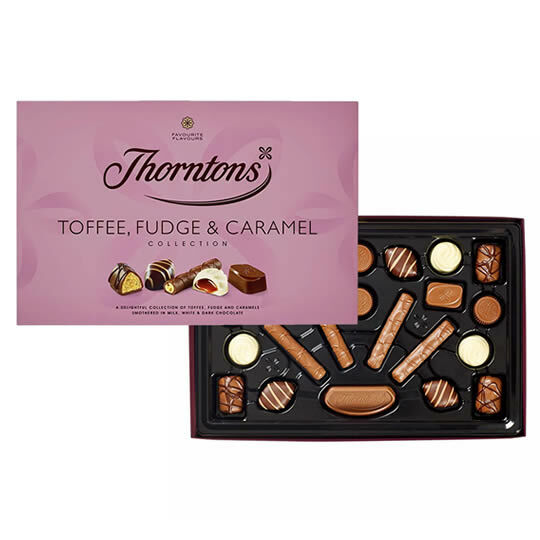 The selection includes popular Thorntons chocolates and new flavours Granola Fudge, soft and creamy with added crunch, and Nutty Caramel, a combination of smooth praline and gooey caramel encased in a silky white chocolate swirl. Flavours: Hazelnut, Granola Fudge, toffee, caramel, fudge. If you are giving the Toffee, Fudge & Caramel Collection as a gift, you can add a special message on the Personalised Toffee, Fudge and Caramel Box, to give a personal touch.